DALLAS – From Canton to Las Vegas. Paul Cotter’s hockey travels will continue, but this time, it’s with his new NHL parent organization. 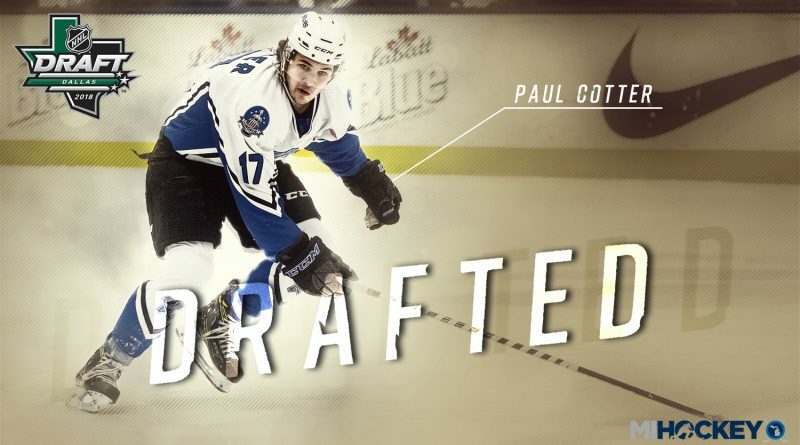 The Las Vegas Golden Knights selected Paul Cotter in the fourth round of the 2018 NHL Draft today in Dallas. Cotter, a Lincoln Stars forward, recorded 39 points in 51 games as a USHL rookie. In 2016-17, Cotter, a Western Michigan commit, was named the NAHL Rookie of the Year after an impressive campaign with the Brookings Blizzard where he posted 60 points in 59 games, along with 103 penalty minutes. The 2016-17 NAHL Rookie of the Year just keeps thriving and improving his draft stock. Cotter, a Canton native, has been projected to go early Saturday morning in Day 2 of the draft, and rightfully so. The Western Michigan commit posted 39 points in 51 games with the Lincoln Stars this year, his first in the USHL. He’s not afraid to mix it up, either – 64 penalty minutes in 2017-18, after 103 the year before in the NAHL. He will be competing for a spot on Team USA’s World Junior roster this summer at the World Junior Summer Showcase, as well.